If you're willing to pay a little extra, you can say goodbye to Spotify's strict simultaneous device listening limitations—and all those Raffi and Dora the Explorer recommendations plugging up your Spotify membership. The music streaming service plans on rolling out discounted family plans that let you add up to four additional users under one billing account. Dubbed Spotify Family, the new subscription tiers allow all household members to have an independent Spotify Premium account complete with separate listening histories, recommendations, and playlists. Even better, this means your listening won't get interrupted when someone else starts Spotify on another device. The story behind the story: With media streaming subscriptions becoming the norm thanks to services like Netflix and Spotify, these companies need to find ways ways to better serve families. To that end, Netflix began testing its multiple user profiles in early 2013, and also rolled out new pricing tiers in January. We've been hoping to see something similar from Spotify for over a year and it appears many others have too. “This is one of the most asked for features from our audience,” Ken Parks, Spotify's chief content officer, said in the company's announcement. 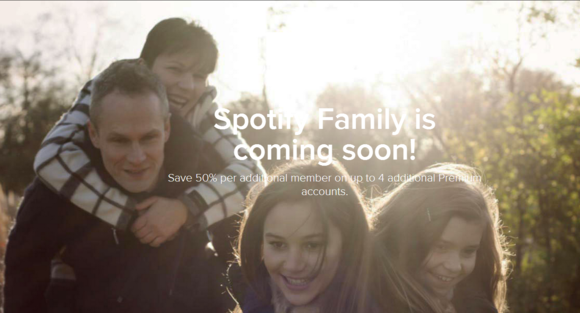 Spotify says each additional family account will be priced at 50 percent off. Since a Spotify Premium account costs $10, you'll pay $15 for two people, $20 for three, and so on up to $30 for five people. That's a pretty good price for multiple users. Spotify rival Rdio, for example, offers its top tier subscriptions for 2 family members at $18 and three members at $23. Spotify's new service isn't available yet. Spotify says the new subscription options will become available globally over the coming weeks.